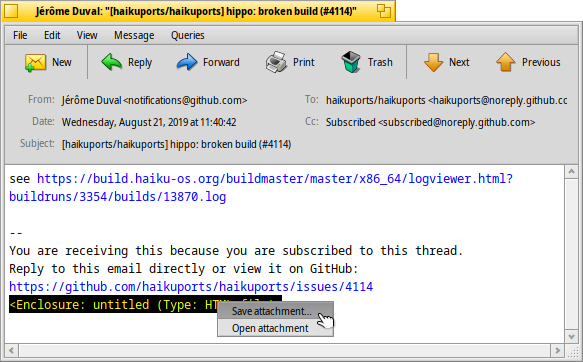 Mail is Haiku's default viewer and editor of emails. It has nothing to do with the actual fetching and sending of mails, which is done by the mail_daemon and can be configured via the E-mail preferences. This page is a general overview of the application Mail. 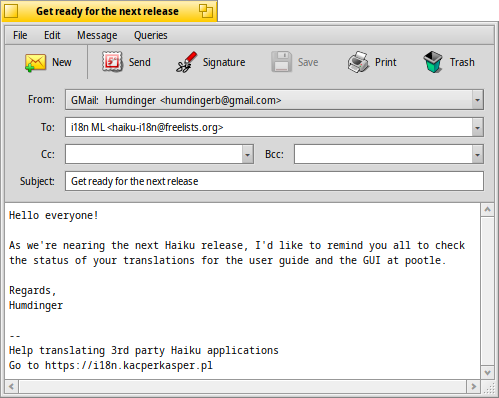 For more information how email in Haiku works, refer to the Workshop on managing email. 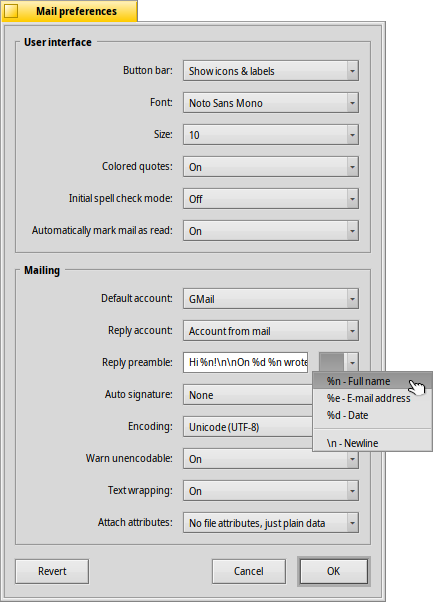 A menu and optional tool bar on top, with an area of the interesting attributes of a mail (to, from, subject, date) below that, and then the actual body of the mail. If the mail appears with strange characters or empty, try to change the Decoding from the pop-up menu. If there are files attached to an email, they are listed at the end of the message. A right-click on one opens a context menu to Save attachment... or Open attachment. You can also drag & drop directly to the Desktop or another Tracker window. Most of the menu and tool bar items are pretty self-explaining, so we'll concentrate just on the highlights. When you close the window of a new mail, its status is normally switched from "New" to "Read". But you can set other statuses as well, by choosing from the Close and... submenu. There you'll also find the option Set to... to create your own custom statuses, which are saved under ~/config/settings/Mail/status/. Here you'll find an item to open Mail's Preferences... (see below) and a shortcut to manage your Accounts..., which will open the E-mail preference panel. Show header ALT H Shows the complete header of a mail, in case you need to track down the path of your mail, for example. 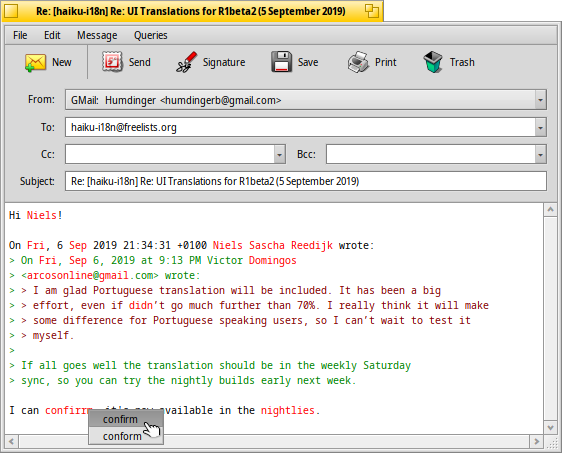 Show raw message Displays a mail in its raw state, i.e. with all its control characters and without Mail's coloring of quotes or URLs, for example.. The different options to reply to a mail may need a bit of explanation. Reply ALT R The standard reply to the server that has sent the mail to you. NOTE: In case of a mailing list post, this normally replies back to the mailing list, not just the person that wrote the post! Reply to sender OPT ALT R This on the other hand, sends directly and only to the person listed in the "From" attribute. Reply to all SHIFT ALT R Replies to the original sender plus all other (cc'ed) recipients of the original mail. The items to Forward, Resend and Copy to new are again pretty self-explaining. When you've opened an email from a Tracker or query result window, Previous message and Next message will move to the previous/next email in the list. Save address collects all email addresses from the header and the actual email body in a submenu. Choosing an address will open the People application in order to complete and save the contact information. This doesn't work yet, but is intended to hold queries that would show all mail related to the currently open mail, like all from the same sender or same subject/thread. 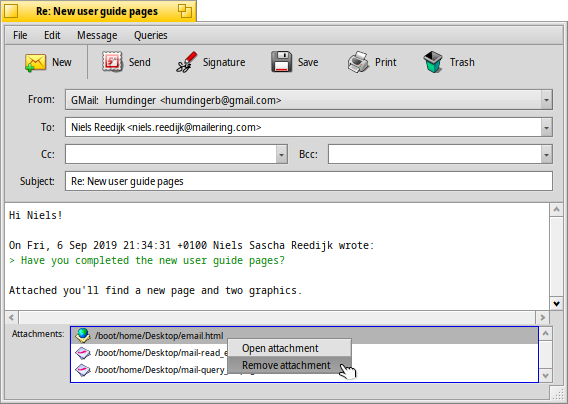 A new email is created by invoking the New mail message menu or the corresponding icon from the tool bar of an open email. Or you just start the Mail application or choose Create new message... from the context menu of the mailbox icon in the Deskbar. The window is pretty similar to the one when reading mails. The menu and tool bar items are slightly different and the text boxes have to be filled with the recipient's email address, subject and so on, of course. Cc is short for the anachronistic term "carbon copy" and results in copies of your mail being sent to the listed people. The difference to just listing a buch of addresses in the "To" field is, that you don't directly address the cc'ed people, thereby signaling that you probably don't expect an answer of them. Bcc means "blind carbon copy" which does practically the same as "Cc", but hides the recipients from each other. You can enter several recipients by separating their addresses with a comma. To, CC, and BCC are pop-up menus. They contain all email addresses on your system found by a query for People files. Their "Group" attribute will sort them in corresponding submenus. Again, we'll focus on the more interesting features in the menus. With Save as draft you can store your work so far and come back to it later. To load it again, choose it from the Open draft submenu that will list the result of a query for all mails with the status "Draft". Quote and Remove quote or their respective shortcuts ALT ← / → are used to add/remove a level of quoting by adjusting the number of ">" symbols in front of quoted lines. Just select some text in all the lines you want un/quoted and invoke the menu item. Check spelling currently only offers corrections of English texts by marking wrong or unknown words red and showing them in italic. Right-clicking such a word opens a context menu offering suggestions to correct the word or to Add it to the accepted vocabulary. Then, there are again the items to open Mail's Preferences... (see below) and a shortcut to managing your Accounts..., which will open the E-mail preference panel. With Add signature you can add predefined texts to the end of your mail. From its submenu you can choose a specific or Random one. You create new or edit existing signatures with Edit signatures..., which will open a window where you enter the text itself and the title of your new sig. There, in the Signature menu, you find items to Open a specific signature or Save or Delete the currently loaded one, Signatures should be saved in ~/config/settings/Mail/signatures. Use Add enclosure... and Remove enclosure to add/remove files as attachments. You can also drag & drop files from a Tracker window. Be careful though to drop those in the header section (To/From/Subject area at the top) or they'll get pasted into the email body if they are text files. File attachments are listed below the header section. You can remove a file by invoking a context menu or by selecting it and pressing DEL. This doesn't work yet, but is intended to hold queries that would show all mail related to the currently open mail, like all to the same recipient or same subject/thread. Button bar Options to show labels under the icons or hide the tool bar completely. Font Sets the type of font used for the email text. Size Sets the font size. Colored quotes Colors different levels of quotation. Initial spell check mode Turns the spell checker on/off on startup. Automatically mark mail as read If you close an email with the Status "New", you can have it automatically marked as "Read". Default account If you have several email accounts, this specifies which to use by default when creating a new message. Reply account When you reply to a mail, you can either always Use default account set in the pop-up menu above, or use the Account from mail, which will send the mail from the same account that received the original message. > so thanks again for the inspiration concerning the cosmological constant. Auto signature Adds a signature automatically to the end of the mail. Encoding Sets the default encoding. Warn unencodable If your mail contains characters that can't be encoded with the currently set encoding method, you can turn on being warned about that. That gives you the opportunity to change the encoding before sending. Otherwise unencodable characters are replaced by rectangle symbols. Text wrapping Inserts line-breaks every 76 characters which makes mails easier to read. Should you opt not to send attributes with your attachments, remember zip up your files before you send them or you'll strip away BFS attributes.